We design engaging, modern and sophisticated websites that work beautifully across various devices including computers, tablets and mobile phones. We help organisations to present cohesive and consistent branding messages across a variety of media, to ensure the marketing message has the maximum impact with the target audience. Whether you need something simple, or extremely complex, our team have many years of experience designing logos, graphics, symbols and icons for organisations we partner with. We have worked on hundreds of application and system interfaces. Designing interfaces so that they are intuitive and deliver a great experience requires an appreciation of aesthetic design as well as functional work flow. Great graphic design requires an understanding of the marketing challenge at hand, a strategy for overcoming the challenge…and then some artistic flair to make the concepts come to life! 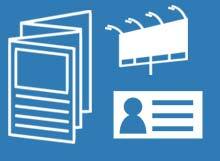 We understand the need for print media such as business cards, brochures, signs, banners and flyers. We are passionate about designing for these forms of traditional media. Great design is not so much about the ideas you come up with, as much as the ones you discard in pursuit of the best idea! We use the I.D.E.A. approach to design, working hand-in-hand with you. We encourage you to get involved and become part of our process. Identify the key problems and define them well, leading to the best solution. Design the concepts and solutions to the unique problem, as a team. Execute the previous stages, making the strategy come to life! Assess the implemented solution by testing, measuring and tweaking regularly. At Partner Digital we combine the visual aesthetic capabilities of a design studio with the brand, marketing and communications knowledge of a traditional agency. We love function and purpose as much as beauty and creativity. Delivering creative strategy design across web, digital and traditional platforms, that achieves our clients’ objectives. Partner Digital has the privilege of working with Vuly Trampolines on an ongoing basis for their website and creative digital strategy. It has been fantastic to work with their internal team and to contribute to their new website. We have received an amazingly positive response about the new Vuly website from customers and staff. Complete Steel Frames is a leading Australian supplier of frames for apartments and residential housing. In 2016 Partner Digital completed revamped their branding, including print and digital media. 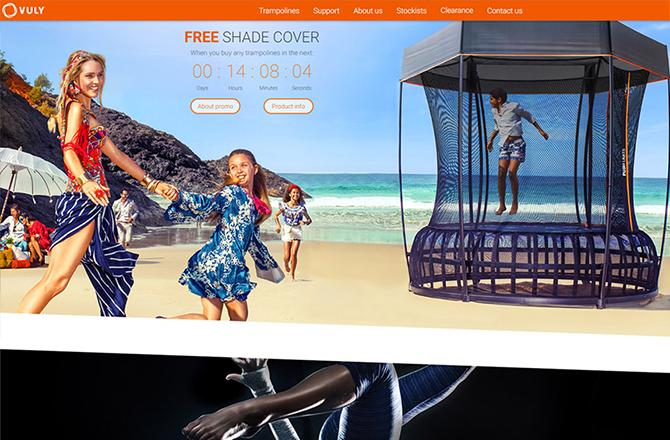 As a result of the new brand and website make over, their website jumped to page 1 on Google and they have received a continuous flow of enquiries. CT4 are a global leader in cloud technology. 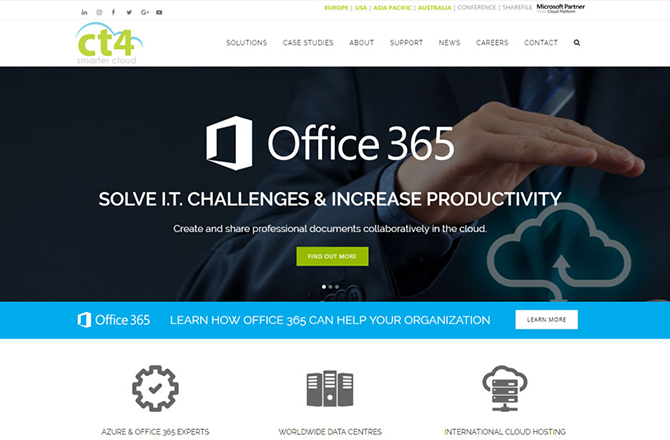 Their organisation specializes in data centers and cloud based software for medium to large organisations. They use Partner Digital for ongoing graphic design and creative work, including brand conceptualization, logo design, print and digital media artwork. James Frames & Art Supplies located in Maleny on the Sunshine Coast Hinterland, is the place to go to for all your framing and creative needs. James Frames got in touch with Partner Digital to rebuild their WordPress website with a new modern design and expanded content to showcase their products and services. Brandi Projects is a display and exhibit design and fabrication company based in Brisbane. They’ve produced innovative experiences for hundreds of clients across government, cultural and corporate sectors. Brandi got in touch with Partner Digital to build a WordPress website to showcase their services and amazing portfolio. Centro Energy is a newly formed division under the Centro Group of Companies, providing independent consulting services in the energy sector. Centro Engery got in touch with Partner Digital to build a WordPress website to showcase their services. Chances Restaurant at The Wharf Mooloolaba got in touch with Partner Digital to build a WordPress website for their restaurant that showcased their incredible view and atmosphere, as well as their extensive menu of food and drinks. The Path to Great Culture needed a WordPress website that showcased their new business. The goal was to create a very polished website that matched the highly energetic, bold, and personalised coaching and training. Blinco Constructions on the Sunshine Coast got in touch with Partner Digital to build a WordPress website for their business that showcased their design and building services. Maleny Wedding Photography got in touch with Partner Digital to build a WordPress website that showcased their incredible photo portfolio and vast experience in wedding photography. Kerrs Electrical Appliance Service Caloundra commissioned Partner Digital to build a modern WordPress website that showcased their many years of experience and wide range of available services. Safety Variety Store had an eCommerce website, but it wasn’t it wasn’t easy to use, and had a dated design. Partner Digital created a new modern WordPress eCommerce website. Bad Hair Day’s Facebook page was no longer on the first page of Google, and they had no website. Partner Digital designed and built a brand new website, and provided SEO services to get it ranking on the first page of Google. A&S Portables got in touch with Partner Digital to rebuild their website in the much more powerful and flexible WordPress CMS, take over the web hosting service, and set up their ad campaigns again in a much more transparent way. Workforce Solutions approached Partner Digital looking for a company to work closely with them to design and develop a new modern and mobile responsive website. Sunshine Coast Building and Pest Reports required a fresh website re-design to give their old website some new life. Partner Digital also are running a Google Adwords campaign targeted to the Sunshine Coast. We worked with Thrive to design and build a fresh and photo focused website to showcase their new pop-up café business. Lloyds Business Brokers is QLD’s leading business broker, having been industry leaders for over 30 years. CT4 had a WIX website which was in need of a rebuild to be fully mobile responsive. Partner Digital has the privilege of working with Vuly Play on an ongoing basis for their website and creative digital strategy. Dr Tuffley required a website to showcase his practice’s services and inform about TMJ treatments. My Translator is an online database driven system, allowing users to order translations of English into Chinese, or vice versa. 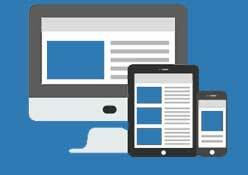 Partner Digital built their WordPress website to provide them with a quality online presence. Partner Digital designed and build DBay Dental a modern mobile responsive website. GT Window Cleaning contacted Partner Digital to design and build a fully mobile responsive site as well as brand and promote the business. AP Homes are based at the Sunshine Coast Hinterland. In as little as one month after Partner Digital started Google Optimisation for AP Homes, their website enquiry rate soared by 3 times the previous amount of enquiries. The Warrego Hote contacted Partner Digital because their current website was looking dated and also needed to work with a new booking system. 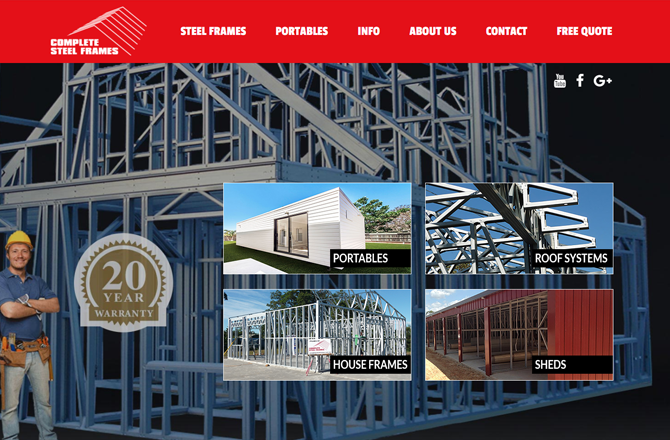 Complete Steel Frames needed a fully mobile responsive site with engaging content such as videos and downloads, and interactive features such as a quote calculator. Need a quote? Have a question? Give us a call! Submit the below form to send us a question or request a quote.